What an image it conjures in my head. It's late summer 1925. A little girl, let's guess about 12 or so, living in a dilapidated Brooklyn tenement, and her one escape from grim reality is on Sunday, when father brings home a copy of the Brooklyn Eagle. He settles in to read the paper and hands the little girl the funnies. She pores over Buttons And Fatty, Hairbreadth Harry and the few other color comics, then delves into the Eagle's Boys And Girls section to work the puzzles and read the stories. She looks at the cartoons submitted by other kids, and she knows she can do better. She's always had a gift for drawing - she covers her school composition book with cartoons, and the kids at school all gather around to enjoy every new creation. Mother went marketing on Friday and asked the butcher for a bit of extra wrapping paper. She carefully rolled it so that it wouldn't be full of creases, and presented it to young Jewell Levine on Sunday morning. This isn't the first time Mama has brought her drawing paper, but this Sunday Jewell resolves not to just doodle all over it. This Sunday she will create the next great comic strip. She'll send it in to to the Brooklyn Eagle, and surely they'll see that it is worthy of publication. Jewell sits at the kitchen table. She can hear the sounds of the city wafting in from the street. Among them she hears the newsboys barking out the headlines. That's a natural, she thinks - surely the Eagle would have a special interest in a comic strip about a newsboy. And thus Ned The Newsy is born. The Eagle did indeed find the comic strip worthy of publication, and not just once. Ned The Newsie (the spelling was changed after the first week) ran in the Brooklyn Eagle's Boys And Girls section almost every Sunday for the next five months. One of the mostly unexplored, yet treasure-laden, aspects of newspaper comics are the Sunday magazine covers. Until the mid-1940s, when Sunday newspaper magazines all morphed into low-rent versions of Life and Look, most Sunday magazines were full-size newspaper sections with fabulous full page artist-drawn covers. Many of these covers were strictly illustrations, but it was by no means a rare occurrence for them cross over into cartoons and even comic strips. 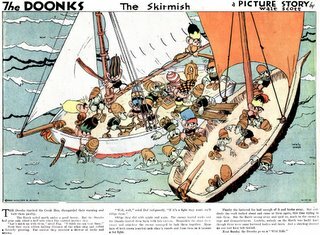 The comic strips that graced the covers of Sunday magazines were seldom of the ruled panel and word balloon variety, though. Because the page was designed as a whole, with no need for the artist to worry about reproduction in various different formats, the pages were typically artfully done as a series of floating vignettes with numbered captions to guide the reader. Sunday magazine cover comic strips almost universally share two properties - pretty girls and poetry. Many of the greatest glamor girl cartoonists plied their specialty on these covers, and one of the most often seen is our artist today, Russell Patterson. He is paired here with another Sunday magazine cover regular, Carolyn Wells. She supplied verses for Sunday magazine covers as early as the 1900s, and her byline was a Sunday magazine fixture for the better part of 40 years. She was a famous 'pop' poet in the days when there was such a thing. Today's sample is the first of the series titled New Adventures of Flossy Frills, and it ran in the Hearst-produced American Weekly on January 26 1941. The series ran on the magazine covers for ten weeeks, ending on March 30 1941. Seldom did these series run for more than about 12 weeks at a time. This is actually the second of a total of four Flossy Frills series that ran on the covers of the American Weekly. 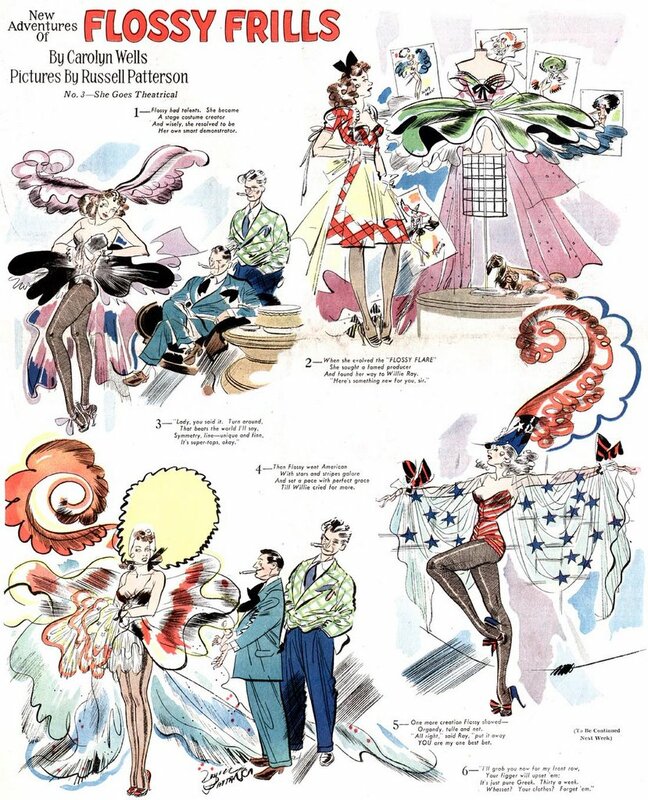 The first was titled Flossy Frills and it ran 11/12/39 - 1/21/40. The third series was Flossy Frills Helps Out which ran 3/16 - 7/19/42, and the last was Flossy Frills Does Her Bit. This last series substitutes Percy Shaw's verse for Wells' (Wells died in 1942), and it ran starting 9/12/43. I don't have the end date for this series. The 1943 Flossy Frills series is the very last Sunday magazine comic strip series that I've been able to document. Anyone know of a later one? A bit late to comment, but I just read the Bud Blake interview in Hogan's Alley and I would love to see more of his Pictorial Review covers from the sixties. If, as he says, he did 30 a year that would make a great collection. In fact, I have collected quite a few of his panel strips from before Tiger and they would make a great Fantagraphics book as well. 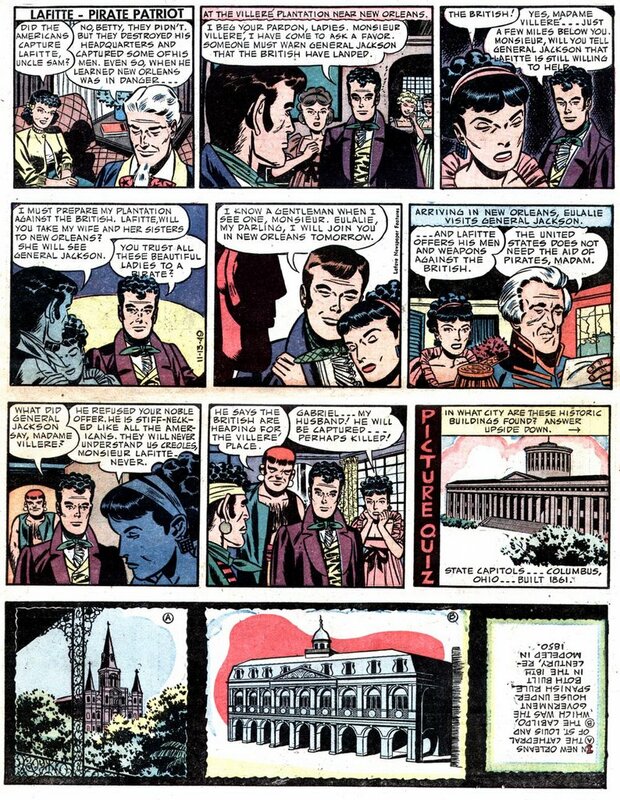 A perennial also-ran on the comics page are the strips that relate stories from history. Perhaps the most successful was J. Carroll Mansfield's Highlights of History, but there have been many others, including The American Adventure. This strip, a product of the small Lafave Syndicate, debuted on January 10, 1949, with writing credited to Bradford Smith and art by Dan Heilman. Smith was a writer of history books, mostly for the juvenile audience, so this was right up his alley. 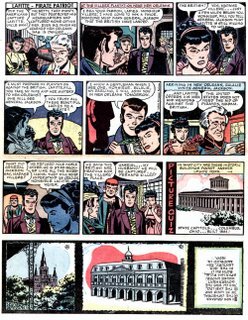 The American Adventure was a Sunday and daily feature that, as do most of the history strips, try to bring history to life in the guise of a comic strip adventure story. Kids are seldom fooled by this ploy and skip the strip realizing that the comics page is committing the sin of trying to teach them something. With the strip not selling particularly well, Dan Heilman, soon to be the first artist on the Judge Parker strip, bailed out in October 1950 and was replaced by Edwin Haeberle, of whom I know nothing. In a desperate bid to save the strip, the history aspect was dumped near the end of the run and it was made over as a fictional adventure strip. Definite end dates for the strip are unknown to me, best I can say is that the daily lasted until at least 10/23/50, and the Sunday until 4/1/51. Does anyone have anything later? I can't help with the dates, but I just had to comment on the eerie resemblance of Lafitte to Johnny Hazard...they could be brothers! In fact, the entire sample strip seems to have a very Frank Robbins-esque quality to it. Love the blog by the way. Thanks for sharing all these great strips! Albert Herbert Hawkins (subtitled The Naughtiest Boy In The World) is a long-running British strip, still popular in the UK. The creator, Frank Dickens, is a successful syndicated cartoonist, illustrator and writer. Unfortunately his one shot at American syndication fell flat. Field Enterprises added the strip to their lineup in late 1979 (12/2/79 is the earliest I've found), but it was gone within a year (my latest example, the one shown here, is 11/2/80). Does anyone have any earlier or later examples? Frank Dickens has a pretty extensive website of his material, at this link. His syndicate can be found here. This is my sole example of a panel feature titled, obviously, The Doonks. It's by Walt Scott and from 1933. Unfortunately the tearsheet I have doesn't 'fess up with the name of the newspaper, and the copyright is to Scott himself, so I'm at a reseach dead-end. Does anyone recognize this series? I'm guessing Scott was doing it either for a particular paper or was trying to self-syndicate it. If someone can identify a paper it ran in, I can probably take things from there with a microfilm request. Walt Scott was a workhorse in the NEA bullpen starting around the mid-30s. His best remembered feature is The Little People. He also did many of NEAs closed-end Christmas strips. It ran in the Cleveland Plain Dealer between (at least) 1931 and July 8, 1934. Since I wrote this post (three years ago) I checked the microfilm of the Cleveland Plain Dealer at the Library of Congress. There I got dates 2/19/33 - 1/5/36. Do you have samples from 1931? Did I miss two whole years of the run? Well, I probably misinterpreted a comment I read. According to http://www.kokoonartsclubofcleveland.org/club-members/scott-walt, he was known for his Doonks in 1931, and I thought that had to be from the newspaper. So the figures existed earlier than 1933, but I have no other indication that they were published in any newspaper before your date... I'm a Belgian, I have no American newspaper clippings at all, but like many of your comic strips. I'm Fram at Wikipedia, I wrote e.g. the articles there on Winnie Winkle, Polly and her Pals, HH Knerr, McNaught Syndicate, ... but mostly based on what I could find through internet sources (Google books and so on). Considering the lack of depth in that bio, I'm going to stick with my date for now. I'll make a research note, though, to check the 1931 Plain Dealer next time I have access to see if I missed something. Thanks for the info! Here, last but not least of the goodies I found in the 1903 San Francisco Bulletin, is a comic by none other than Russ (Tillie the Toiler) Westover. He would have been about 17 when this was published. Perhaps his first newspaper appearance? His early, pre-Tillie style is already pretty mature here, so he was definitely ready to be put in harness. This nice piece was used as a heading on the Bulletin's Sunday kids' page, where most of the art was submitted by readers.